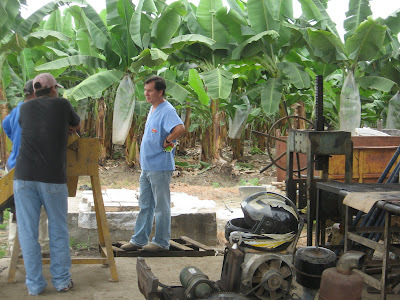 "Hangin' with a cool bunch" a tour of a Dole banana farm in Calcetta, Ecuador. Curious people are interested in the world and learning about everything in it. We all start out that way, but as children we are overwhelmed with rules and obligations, and discouraged from challenging authority. This effectively squelches our natural inquisitiveness. We reach adulthood somewhat jaded and closed-minded, and desiring certainty. Curiosity is essentially an attitude toward living that leads us - often late in life - to travel and explore life's infinite shades of grey. Join us in our visit to a banana farm. 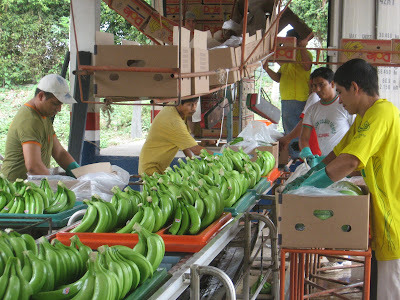 Ecuador exports more then 34 % of the world's banana production of 100 million tons in a market, which generates over US $5 Billion per year and employs millions of workers The country vies with Costa Rica as the leading exporter to Canada and the U.S. with its principal exporting markets being the European Union, Argentina, Chile, and Japan. There are two main varieties of bananas, the fruit or sweet banana and the plantain. Surprisingly 80 % of the banana's grown worldwide are of the cooking plantain variety. 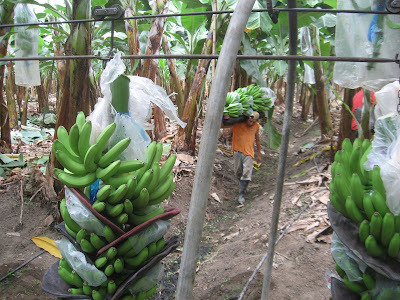 Consumers prefer Ecuadorian grown bananas because of their exquisite taste and longer shelf life, while importers choose them for their unmatched quality, resistance to disease, and guaranteed availability (due to the year-round growing season). About 1 ½ hours drive inland from Bahia in a city called Calcetta are the agricultural valleys where we find this banana farm. The banana plantation owner, and our tour guide is Canadian born engineer, John Megson who has lived, and been involved in agriculture endeavors in Ecuador for about 30 years. He is currently the Vice-President of the Ecuadorian Canadian Chamber of Commerce – actively promoting trade relations between the two countries http://www.ecuacangye.com/nosotros_eng.php. His son Jacob has now completed his agricultural degree and is assuming the banana farm's management. Bananas are not real trees, although resembling, and often called a palm, they are actually a perennial herb. The stalk dies back after each fruiting and the suckers produce the next fruit. 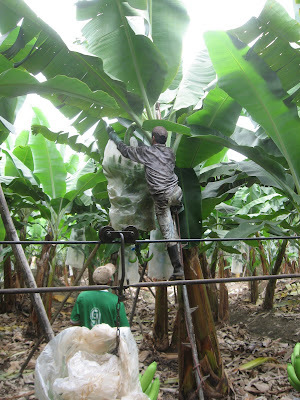 Bananas are propagated from rootstocks that are carefully transplanted. They require an average temperature of a humid 27 degrees Celsius with a minimum of 3 1/2 inches of rainfall a month, thus they are grown primarily in equatorial countries. 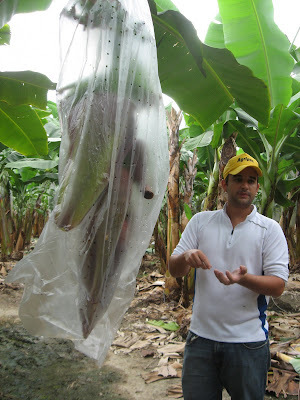 Banana plants like moist, rich, fertile soil with lots of organic matter, humidity, and shelter. This requires massive diesel engines for the pumping stations for water requirements and employs a complex and extensive filtration, and drip and regular irrigation system. The soil must also have excellent drainage or the rootstocks will rot. 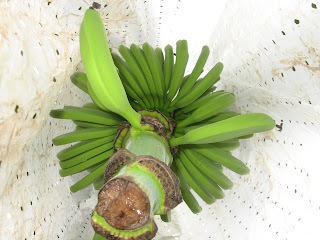 Each banana bunch received a colour-coded ribbon when the developing flower was initially protected with a plastic bag. 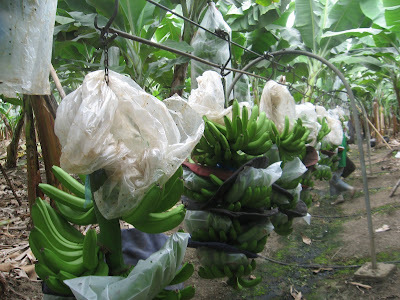 This protects the growing bananas from harmful insects, disease, and a sunburn! Bananas are mature about three months from the time of flowering, with each bunch producing about 15 "hands" or rows. 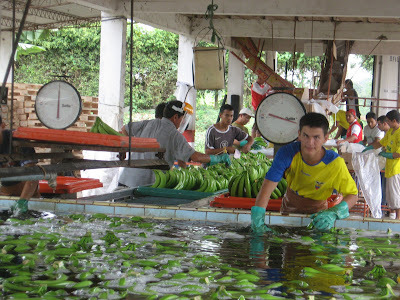 Each hand has about 20 bananas while each bunch will yield about 200 "fingers" or bananas. An average bunch of bananas can weigh between 60 and 120 pounds. As the plant becomes heavier with maturing fruit, it must be supported with poles. The stems are made of layers and layers of leaves that are wrapped around each other. Though quite large and thick, the stems are not strong and woody like most fruit trees and can break under the weight of many bunches of bananas. The team then moves through the plantation harvesting the plants with the coloured ribbons that are determined to be ready. For export purposes ready is considered six weeks prior to maturity! We watched the harvester ascend the banana plant on a pole like ladder trimming the leaves, checking the banana's for correct size and then whack the banana bunch with a machete. The bunch is then carefully lowered onto a rubber tray on a team member's shoulders so the bunch is not bruised. He then transfers it to a hook attached to one of a series of conveyer cables that run throughout the plantation (crossing public roads in several instances) to be taken to the packing station. Once the bunch is harvested the plant will die quickly so it is cut to make way for the new sucker growth. When the bananas arrive at the packing section the bunches are taken off the stock, checked for size, and submerged in a big pool of water. Dole has stringent quality control guidelines to follow. 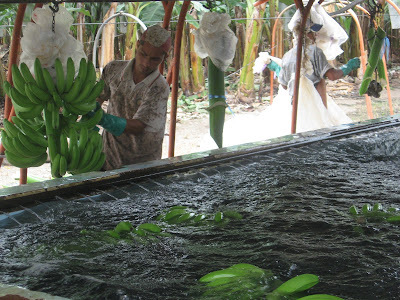 The bananas are then put into another pool of water, which also contains a bit of soap to stop "bleeding" their natural latex or rubber substance that tends to stain the bananas as well as clothing, and then at the end of the pool they are taken out and put on trays. Each tray is filled with about 40 lbs. of bananas. The stem is coated with a product so that it will not rot and then stickers are put on the bananas as they go along the conveyor. Boxes are unfolded in a room above and descend down a conveyor belt to form the new six-week home of the banana's as they are internationally exported. Boxes are palatalized and shifted to the waiting refrigerated container. A 40' trailer is filled daily and transported directly to the port. This is such a major industry that Dole has built their own dedicated port facilities ( $ 35 million dollar facilities. ) in Ecuador, San Diego California, and several other locations throughout the world. Once they reach their destination port they enter a special warehouse facility filled with a gas to expedite the ripening process so they can shortly be placed on your local supermarkets shelves. This Banana plantation grows, processes, labels, packages, and ships their product directly from the plantation to worldwide markets. It encompasses 80 hectares, two processing facilities, and employs about 95 remarkably hard working and happy full time staff. The farm is very self sufficient growing bamboo to prop up tall trees and to bridge irrigation and drainage canals, large vegetable gardens for employee meals; metal fabrication and mechanical shop; medical staff, and staff recreational games facilities. Adjacent to the plantation is a teak farm and a new agricultural University ESPAM with grounds and new buildings to rival UBC Okanagan.It was a very interesting day completed with a healthy & tasty meal in the large farmhouse. We received a 40 lb box of the same green bananas headed to North America. I am sure with the heat here they will ripen sooner than the six weeks but they will be interesting to observe and taste, bake with etc etc …. 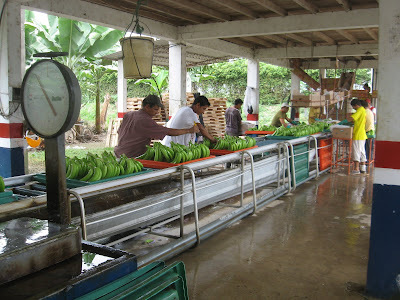 Labour conditions in the banana industry have historically drawn attention in criticism of traditionally poor industry working conditions. This is a socially responsible plantation providing employee bonuses based on both production and higher market prices and regularly investing in social improvements for their employees. I believe it was reflected in the unified and happy workforce. 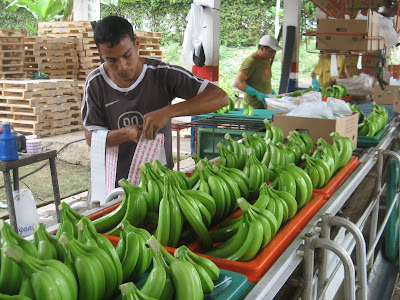 Fair Trade Banana Farming usually results when consumers are willing to pay a premium price for bananas, if the means of production are consistent with the philosophies of Fair Trade. The United Nations description of fair trade banana production "for banana producers this means they obtain a price which covers the cost of production and an additional price premium to be invested in social, environmental or quality improvements. 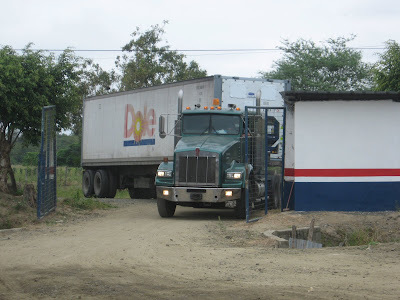 Dole is a major international food producing company.